With so much time passing, FXEN should have been able to core and reach the rotleigend by now. Associates of mine have been to the drill site and have reported that coring and/or drilling have been taking place almost every day for the past two weeks; from what we know from the August 20th press release, there has been more than enough time for such coring to reach the rotleigend and discover once and for all whether the formation is gas-bearing. Why would FXEN be casing the rotleigend (assuming that is what they are doing) right after coring into it? Considering that FXEN has been coring, by now the rock samples would have been analysed for porosity and permeability. They would have known if the formation contained gas or -gulp!- salt water. There would be no reason I could think of to case a well that contained salt water. Therefore, one could make the logical assumption that if they are truly casing the rotleigend then FXEN believes there is something behind the pipe worth protecting. Why wouldn’t FXEN have performed a quick drill stem test (as FXEN had previously done with the Kromolice-2 for example) and flare the well? I can’t answer that. However, upon spotting gas shows at the most recent well, the Komorze-3K, FXEN’s partner and well operator PGNiC decided to forgo doing a drill stem test and went directly to running a full production test. Is the fact that FXEN is setting casing at the Kutno-2 a sign that they are completing the well and going straight to a production test? There seems to be a lot of unanswered questions. At this point you can draw your own conclusion as to the eventual outcome. With the stock at close to $8 there is ample opportunity for any nervous shareholders to sell. But to my untrained mind, it seems that FXEN’s apparent decision to set casing at, near or below total depth is a positive one. If I am right about that, shareholders, not sellers, will be the ones ultmately rewarded. If anyone amoungst my readers has a strong opinion one way or the other please don’t hesitate to email me. Disclosure : At the time of the publication of this report, I am long FX Energy common stock and call options. Disclosure #2 : FX Energy is an extremely volatile small-cap equity, and as such an investment in FX Energy is ONLY suitable for investors with a strong tolerance for risk. Recently there have been a number of postings commenting on this piece on various financial message boards. The comments broadly cover two topics : 1) the photos I attached to this story look fake, and 2) the pipes shown in the photos look more like drill stem than casing. The first issue was quite amusing to me. If you have been reading my blog for the past year you know the depth at which I cover special situations. To think that I would doctor photographs is laughable. Furthermore, even if you don’t know me or my work, it would be foolish to think I would do something that could be proven false in a second – anyone who has been to the Kutno-2 site in the past two months knows what it looks like! I do, however, have to apologize for the grainy look of the photographs. The drill site has a full complement of security staff, and while my associates were very careful not to tresspass, I didn’t want to have anyone taking photographs from the public roads in plain site as that might antagonize someone. 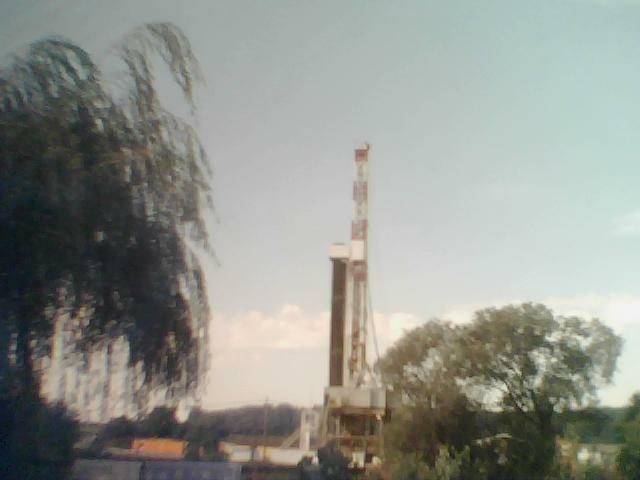 Therefore, my photographs were taken over time by a webcam established approximately 200 meters from the drill site, on private land leased by me, sitting on a server that is accessable remotely by me. Addressing the second question : When I visited the site personally in early to mid August I observed the casing of the Zechstein. 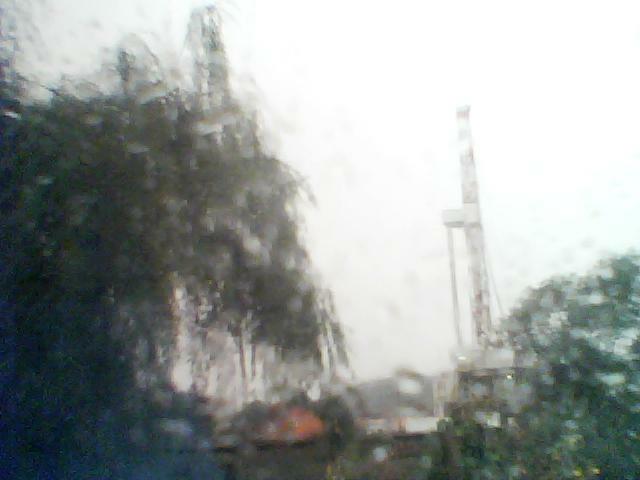 I also observed pictures taken by my webcam of what I believed to be drill stem used in late August and early September to core into the Rotleigend. I certainly observed the drill itself used in the coring. To my untrained eyes the pipe used recently appears to look very similar to the pipe used to set casing at the Zechstein. However, since I am not working on the rig and have no access to information other than what is observed by me and my associates near the Kutno-2, I cannot state with 100% certaintly that FX Energy is lining the Rotleigend. That is why I couched my piece in the type of uncertain language that I used, as well as asking for comments from my audience at large. I continue to have associates on the ground near the Kutno-2 site as well as access to the webcam, and will share important updates from them with my readers on my twitter feed. While I remain optimistic with the chances of sucess at Kutno, I want to again stress that an investment in FX Energy entails an enormous amount of risk and that my readers should carefully consider whether a position in FX Energy is at all suitable for you given one’s investment posture. All of those call options are owned by people who are essentially gambling on the outcome of the Kutno-2 well (ignore for a moment the minority of holders who are in those derivatives as part of a hedging strategy; writing this blog allows me to gauge my readership and I know by seeing my email traffic that very few call holders are hedgies. Besides the volume of the stock is such that it doesn’t attract those kinds of players by and large) and like most of us, we thought the news would have been out by now. All of these calls are expiring today. Now that’s bad for the call owners. But its also not good for the option market maker who is most likely on the other side of most of those contracts. That’s because these call sellers needed to buy common stock when they first sold the calls to the speculators, and they bought stock in some ratio. Call sellers own stock to hedge the risk that the option they are short goes up as the stock goes up and they then need to make good on those calls. Now that the liability (ie. the short call) is going away, these market makers need to liquidate the stock they bought in the first place. All of the above is B-School Equity Options 101. But what makes FXEN interesting here is because so many calls are outstanding relative to the daily volume that the option market makers can’t sell the common stock near the close of trading today, like they normally would for a heavily traded option name like Apple. Instead, they slice up their order and execute it over many hours. In the case of FX Energy there is so many shares to be sold relative to daily volume that it appears to me they started selling yesterday. Other shareholders see the volume come into the name, get nervous, and start to lighten up. It’s a classic trading pattern I’ve seen dozens of times on highly controversial “binary event” type names. The call sellers could actually end up losing money as they sell the hedged out stock into a falling market. The 30, 40 or 50 cents they once pocketed as premium for the call sold ends up getting eaten away by the decline in the stock price. Now option sellers don’t need to own stock on a 1:1 ratio. Instead they follow a formula that constantly adjusts the holding of stock relative to how close the stock price is to the strike price. In the case of FXEN, I’d say there is probably 250,000 shares for sale today, and the stock price will have to get much lower than $8 for all those shares to find a comfortable home. The situation is further compounded by the fact that the company is speaking Monday. If you are already a shareholder, why buy today in front of that event? Why not wait until the dust settles, see what additional information has been released if any, and make your buys then. All of the above is fertile ground for a slow meltdown. As a bull on the name, its a great opportunity to buy stock for a short term trade if you believe the fair value of the name is higher than where it is now. I lightened up my position in the last few days to prepare for this pre-option expiration selloff. Is it possible that someone knows something negative about Kutno-2? Always a possiblity. But what are the odds that happened just as the market makers geared up for some serious selling? Not likely. Guess I’ll take my chances. Therefore, as the call sellers liquidate, I’ll be buying. Unless we get bad news over the weekend, these should turn out to be good buys. Guess we’ll just have to see what Monday brings!